2019 Open Nationals Qualification Update: Including this camp there are two more Open Nationals Qualification Provincial camps in Alberta. U16/U18/U21 athletes need to participate in 3 training camps in the season to be eligible for nationals. Seniors only need to participate in 1 training camp. Competition Minimums: 20 matches or 4 competitions for U16 and 5 competitions for U18/U21/Senior. Veteran and Ne-waza competitors need to compete in 1 training camp. Talk to your coaches/clubs regarding your status. 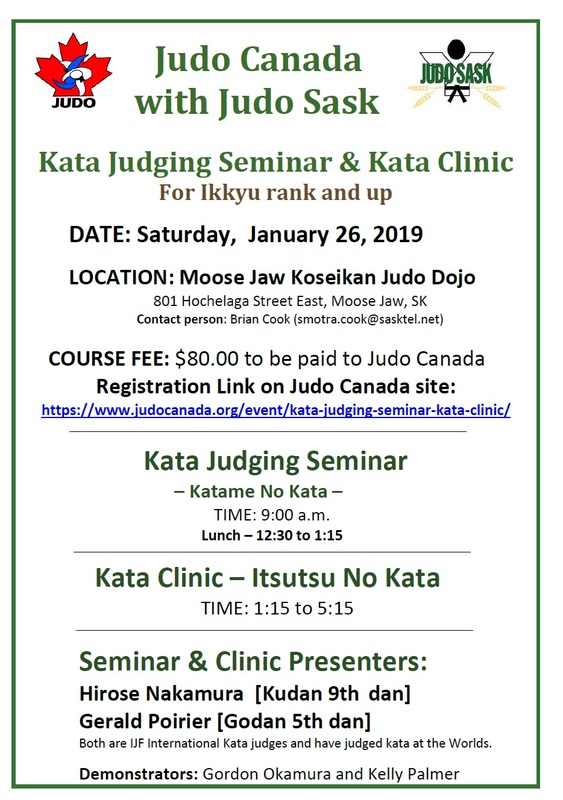 The Tolide Judo Club will host the 2019 Provincial Judo Championship at the Dow Centennial Centre in Fort Saskatchewan on Saturday February 2. We are currently recruiting for volunteers to help host the event. Your support is greatly appreciated. If you have any questions, please contact Richard Gagnon, Volunteer Coordinator at richardjgagnon9@gmail.com. The International Judo Federation (IJF) has released the new Kata competition criteria for evaluation. Please refer to the 2019 Kata Competition handbook for more details. To download the handbook please click here. The 2019 Judo Alberta Provincial Championships will be held on February 2nd, 2019 at the Tolide Judo Club (8700 84 St, Fort Saskatchewan, AB T8L 4P5). You must register for this tournament online at https://www.trackiereg.com/2019JudoABChamps by Sunday January 27th, 2019. Please note that this is a Team Alberta mandatory event.